Is change scary? ~ Yes! Is change exciting? ~ Absolutely. Is change risky? ~ Definitely! 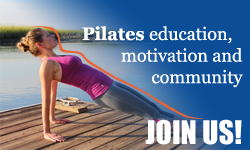 A couple of months ago I got connected with a wonderful local Pilates teacher who invited me to take a class at her studio. I am always eager to build new connections so I jumped all over this opportunity. I was super excited to have a private session with Monica Hoekstra, the owner of Absolute Pilates in Charlotte NC, because she has a beautiful new Gratz-equipped studio. Even though I went through the contemporary training (Balanced Body) I have deep love and respect for the Classical Pilates. Monica has a very extraordinary Pilates story. She started as a STOTT Pilates teacher and even offered STOTT teacher training for many years in Charlotte NC. And then she decided to take the Classical road. She was ready for a change as a teacher. It’s understandable, as teachers we always love to grow and expand our teaching toolbox. BUT Monica went beyond her personal teaching style. She completely changed her studio philosophy, her class offerings and of course all apparatus. So was it a scary change? Was it worth it in the end? You can find out if you listen to this quick interview with Monica Hoekstra in her beautiful studio Absolute Pilates. Ask your questions or leave your comments below! HELLO MONICA, I AM WONDERING IF THE CLIENTS WHO LEFT WHEN YOU TRANSITIONED TO CLASSICAL PILATES ACTUALLY TRIED THE SYSTEM AND THEN LEFT, OR DID THEY DECIDE JUST BY HEARING THAT YOU WERE GOING TO CHANGE THE FORMAT TO CLASSICAL? I would say that the majority of clients that left did so because they were loyal to their Instructor. And we basically lost those clients of the instructors that chose to leave. Bravo, Monica!!! I remember meeting you at the classical Pilates conference in Florida with Christi Allen Franchini. We had the same sandals and the same name 😊. Congratulations on your successful journey. I hope to do a bridge program with Romana’s Pilates in the future. Thanks for sharing your story. It is very inspiring to me! Thank you for your kind words! And yes … we had the same awesome sandals!! I so encourage you to do the Romana’s teacher training program – it is a lot of hard work but you will never regret it! You are welcome to reach out to me with any question and I will answer as best as I can.